Artist cymbals are made using a combination quality craftsmanship plus tried and tested lathing and hammering techniques to produce the best sounding cymbals at the fairest prices you'll find. You have to hear these to believe the quality. 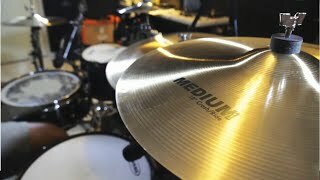 The Medium Series is a super versatile cymbal, great for a wide range of styles. The medium thickness and unpolished lathing makes for a classic cymbal sound that is bright, pure and expressive. Perfect for all levels of playing, beginner to expert.